While the book does not state that the contents represent the sole views of the author, it is interesting to note that each of the books published in the series following this one does include that standard disclaimer. Noah and the Flood presents the author's views rather assertively, almost as though Elder Petersen were writing authoritatively regarding official church doctrine. However, he does not attempt to engage ideas regarding the flood and other topics put forward by other general authorities that may not fully agree with his positions. Elder Widtsoe, for example, provided several thoughts on how the flood might have played out that allows for more nuanced views of this event.1 Thus, it is important to note that while the book does not disclaim the personal relevancy of its contents as Elder Petersen understands and interprets the scriptures, it should be implicitly understood that this book represents his own views and not necessarily the church's positions on these topics. To support the position of the historicity of Noah and the flood, in conjunction with the limitations placed upon the (KJV) Bible per the eighth article of faith, Elder Petersen quotes the flood story from various translations of the Bible. This is done to illustrate the consistency between translations regarding Noah and the flood. This is an interesting methodology because it seems that Elder Petersen interprets the idea behind AoF 1:8 as strictly referring to modern translation, rather than the reliability of the underlying text (i.e., the Masoretic Text, LXX, Vulgate, etc.). Nonetheless, this method also speaks to the cultural idea within English-speaking Mormonism that the KJV is the only Bible that Latter-day Saints use. While the KJV is the English-speaking version officially used by the church, Elder Petersen's efforts illustrate that our studies do not need to be limited to the KJV. Somewhat unrelated to Noah, or the flood, Elder Petersen comments regarding latter-day inventions and the spread of the gospel: "Inventions have come as the Church has required them in its rapid growth. When fast travel was needed to service distant regions of the earth, jet planes were made available. When means were needed to handle the rapidly increasing membership records and whole libraries of names for temple and genealogical work, computers came. When there was a need for extensive coverage by the spoken word and by picture, radio and television and satellites came. The Lord has inspired inventors of the world to produce their work not only for the good of mankind, but also and especially for the onward movement of His kingdom. Where the Church is, these enlightening processes are put to work for the extension of the Lord's kingdom" (91-92). Elder Petersen addresses other topics like Noah as Gabriel, similarities between Noah's ark and the Jaredite barges, and various other topics, however, the items noted above are those that stood out to me as interesting contributions from Elder Petersen. Noah and the Flood seems to have been written for an audience that isn't particularly concerned with many of the details or arguments regarding Noah and the flood (or the ark), since the book provides a broad overview of the topic and doesn't engage the detailed arguments of modern scholarship. Again, his emphasis is upon the value of modern day revelation, although I personally believe that modern day revelation allows for more nuance regarding these topics than this book allows for. "We tell the story of scripture, and scripture is the word of God, verified by modern revelation over and over again"
It's just another example that LDS don't have a good grasp on how to read scripture competently. Thank you for your comment. I appreciate your participation here as well as your assessment. Generally speaking, I might agree with you to a certain extent that Latter-day Saints read and interpret scripture quite literally. However, this is no different than most Christians, so I wouldn't say that this is an isolated problem, or one that would be fair to criticize Mormons in particular for. That having been said, I would suggest that your extrapolation lends itself to being an association fallacy. Is it fair to extrapolate an argument regarding literal scriptural interpretations across all of Mormonism based on a single book? Perhaps you meant (although it wasn't said) that this book is a representative example? I'll leave this for you to answer. A few things should be pointed out here if we are going to look at this issue critically, though. First, my post is just a book review and not an endorsement. Second, Elder Petersen's interpretation is only one interpretation and doesn't represent the Church's position (see my reference above to Elder Widtsoe, for example, for an alternate point of view). Third, this book is clearly not written for an academic audience. 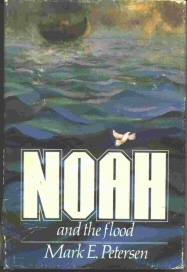 It is only 93 pages long and seems to have been written for youth, or perhaps adults with little to no familiarity with Noah's story in the scriptures. I personally take exception to some of Elder Petersen's conclusions in this book so it would be well to consider that I'm just an inconsequential Mormon with potentially representative views (if we are going to extrapolate...). Additionally, the quotation you provide at the beginning of your comment can be true without implying a literal interpretation of scripture. As the sentence stands, I don't have a problem with it.